How do we get ready for Halloween when Thanks giving is just around the corner? Answer: you make decorations that can be used for both celebrations. As we celebrate Thanksgiving this weekend in Canada, our family will have a few new decorations to set upon our table. Then in a few weeks we can use them again for Halloween! 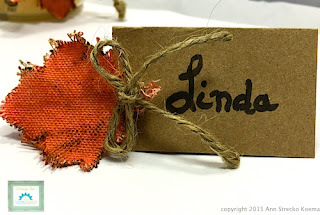 Today over at the Linnie Blooms Blog where I am a Designer on their Design Team I share this easy two for one project. 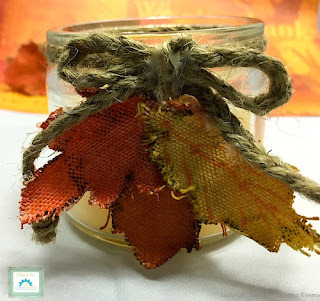 To make a similar candle all that is needed is a candle that comes in a glass jar, some jute cord, several canvas die cut leaves, acrylic paints, a pen, ink, and hot glue sticks. 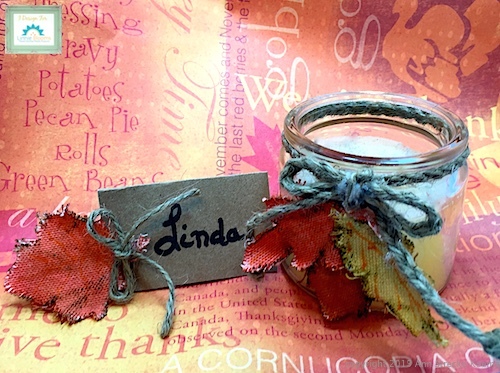 To make the place setting all that is required is a piece of card, a pen, a canvas leaf, paint, a mini clothes pin, a magnet, and glue. Tattered Angels Glimmer mists in: "Lemongrass, Golden Terracotta, and Tuscan Sun"